A node.js module for interfacing with Apple Push Notification, Google Cloud Messaging, Windows Push Notification, Web-Push Notification and Amazon Device Messaging services. Automatically detects destination device type. Written in ES6, compatible with ES5 through babel transpilation. Include the settings for each device type. You should only include the settings for the devices that you expect to have. I.e. if your app is only available for android or for ios, you should only include gcm or apn respectively. isAlwaysUseFCM: use node-gcm to send notifications to GCM (by default), iOS, ADM and WNS. iOS: It is recommended to use provider authentication tokens. You need the .p8 certificate that you can obtain in your account membership. You should ask for an Apple Push Notification Authentication Key (Sandbox & Production) or Apple Push Notification service SSL (Sandbox & Production). However, you can also use certificates. 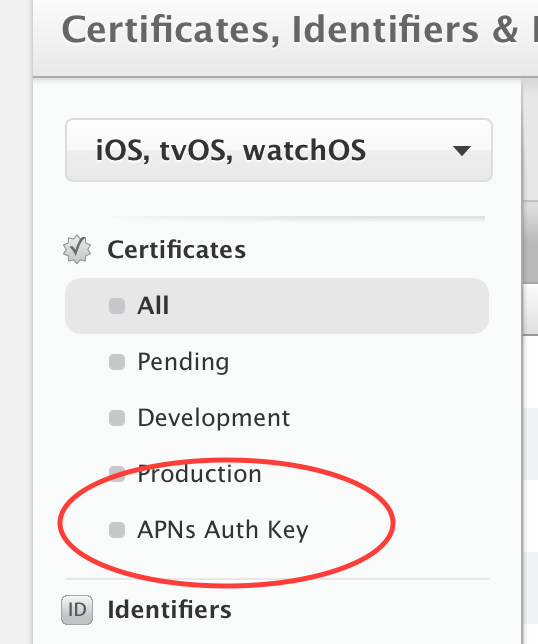 See node-apn to see how to prepare cert.pem and key.pem. You can send to multiple devices, independently of platform, creating an array with different destination device IDs. Create a JSON object with a title and message and send the notification. contentAvailable: true, // gcm, apn. node-apn will translate true to 1 as required by apn. // mdm: '', // apn and gcm for ios. Use this to send Mobile Device Management commands. err will be null if all went fine, otherwise will return the error from the respective provider module. success: 0, // Number of notifications that have been successfully sent. It does not mean that the notification has been deliveried. failure: 0, // Number of notifications that have been failed to be send. regId: value, // The current registrationId (device token id). Beware: For Android this may change if Google invalidates the previous device token. Use "originalRegId" if you are interested in when this changed occurs. originalRegId: value, // (only for android) The registrationId that was sent to the push.send() method. Compare this with field "regId" in order to know when the original registrationId (device token id) gets changed. In case your app is written with Cordova / Ionic and you are using the PhoneGap PushPlugin, you can use the phonegap setting in order to adapt to the recommended behaviour described in https://github.com/phonegap/phonegap-plugin-push/blob/master/docs/PAYLOAD.md#android-behaviour. iOS supports silent push notifications which are not displayed to the user but only used to transmit data. You can send silent push notifications by sending a push notification with normal priority and no sound, badge or alert. Note: Please keep in mind that if data.accessToken is supplied, each push notification will be sent after the previous one has been responded. This is because Microsoft may send a new accessToken in the response and it should be used in successive requests. This can slow down the whole process depending on the number of devices to send. Data can be passed as a simple string payload. If you do not pass a string, the parameter value will be stringified beforehand. Settings are directly forwarded to webPush.sendNotification.